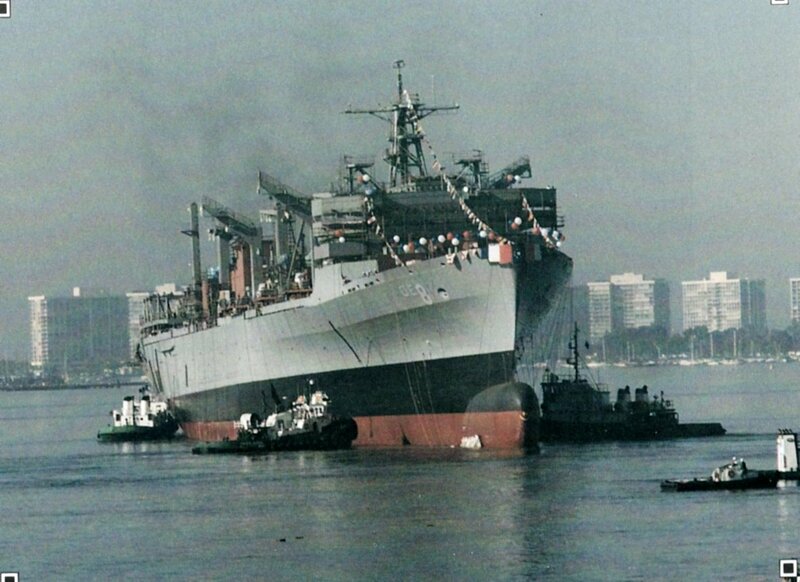 Laid down, 2 December 1991 at National Steel and Shipbuilding, Co., San Diego, CA. 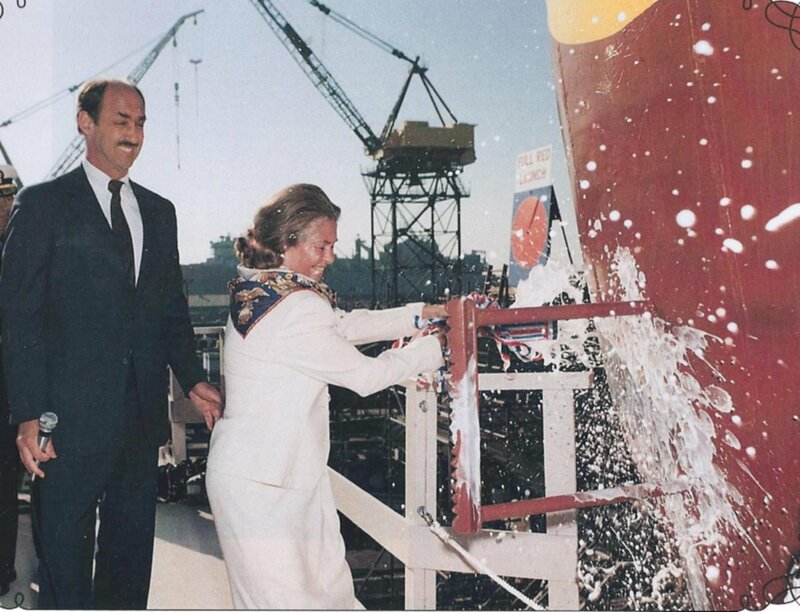 Arctic is assigned to MSC Atlantic and is homeported at Naval Weapons Station, Earle N.J.
193k Arctic (AOE-8) launching, 30 October 1993, at National Steel and Shipbuilding, Co., San Diego, CA. 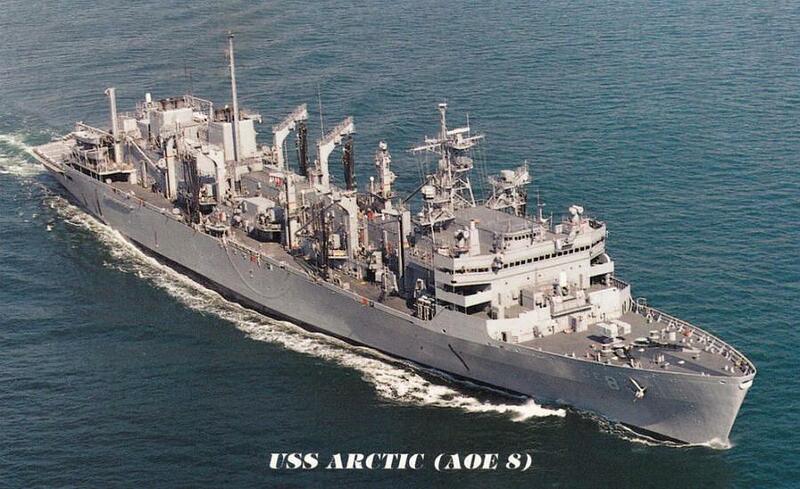 86k USS Arctic (AOE-8), date and location unknown. 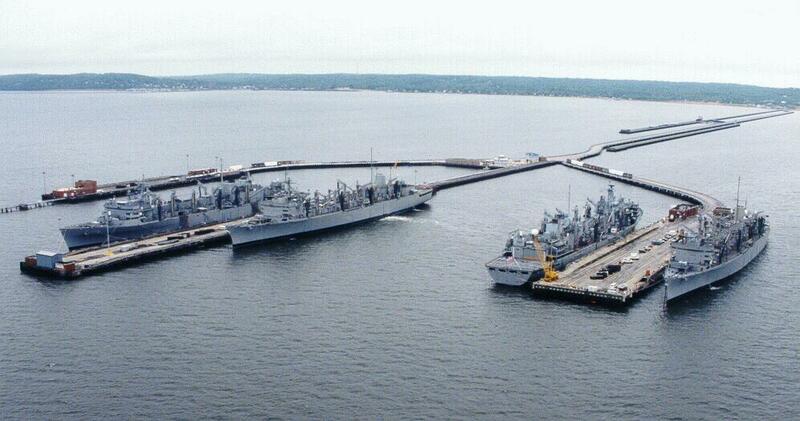 USS Detroit (AOE-4) moored at Naval Weapons Station Earle, N.J., date unknown. Richard Miller BMCS USNR Ret. 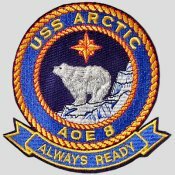 58k USS Arctic (AOE-8), date and location unknown. 76k USS Arctic (AOE-8) under way, date and location unknown. 103k USS Arctic (AOE-8) under way, date and location unknown. 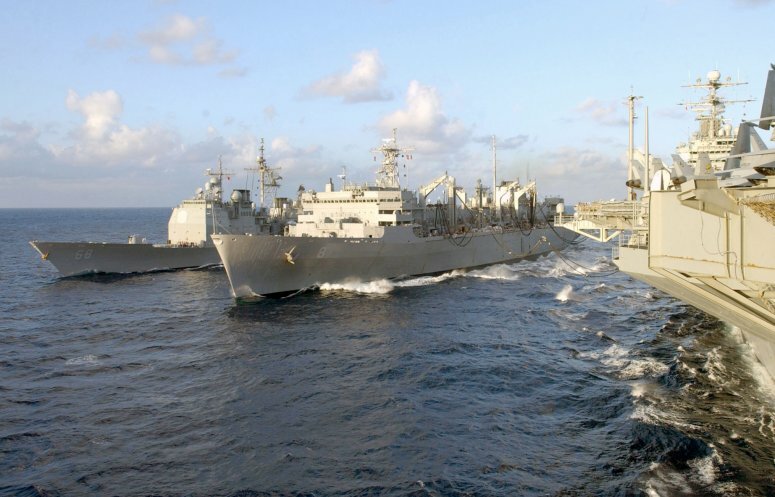 79k USNS Arctic (T-AOE-8) conducting an underway replenishment (UNREP) with USS Theodore Roosevelt (CVN 71) on her port side and the guided missile cruiser USS Anzio (CG 68) off her starboard side, in the Caribbean Sea, 11 January 2003. 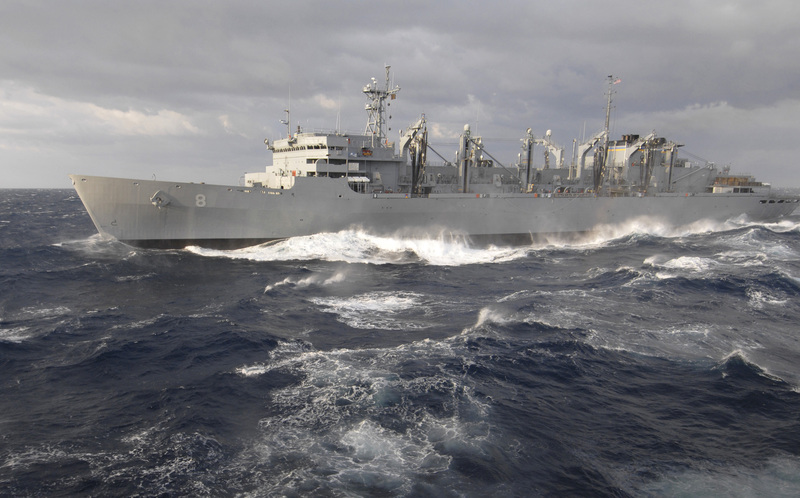 73k USNS Arctic (T-AOE-8) steams alongside USS Theodore Roosevelt (CVN-71) during an underway replenishment (UNREP), 22 May 2003. 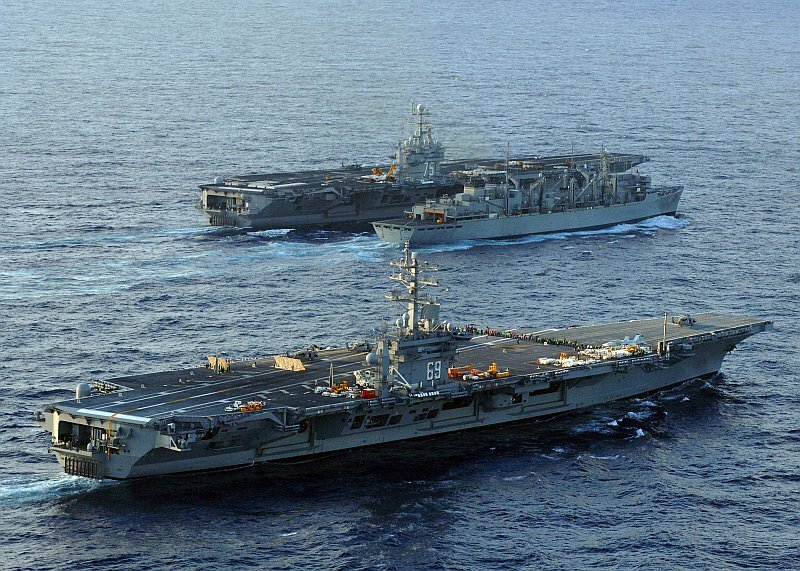 The nuclear-powered aircraft carrier is transiting the Atlantic Ocean to her homeport at Norfolk, VA.
100k USNS Arctic (T-AOE-8) holds station while USS Harry S. Truman (CVN-75) makes her approach to conduct an underway replenishment in the Persian Gulf, 4 December 2004. 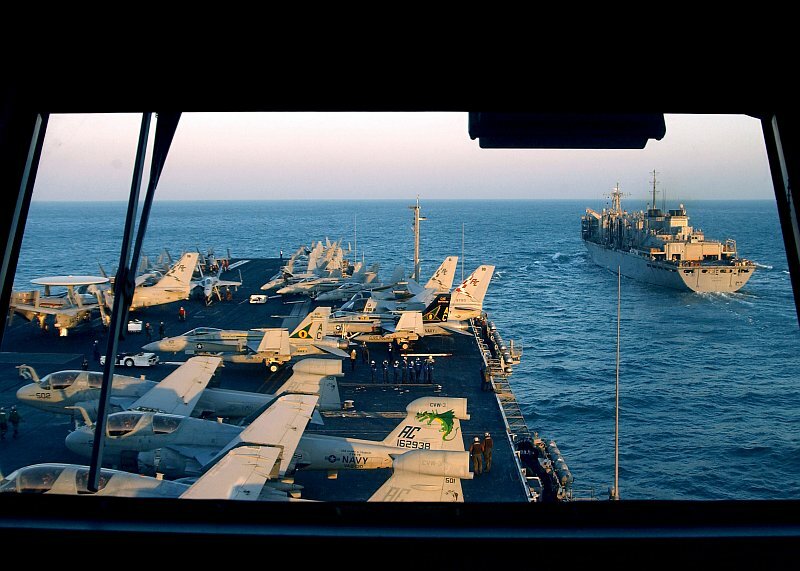 Harry S. Truman's Carrier Strike Group Ten (CSG-10) and embarked Carrier Air Wing Three (CVW-3) were on a regularly scheduled deployment in support of the Global War on Terrorism; aircraft from CVW-3 were providing close air support and conducting intelligence, surveillance, and reconnaissance missions in ongoing operations over Iraq. 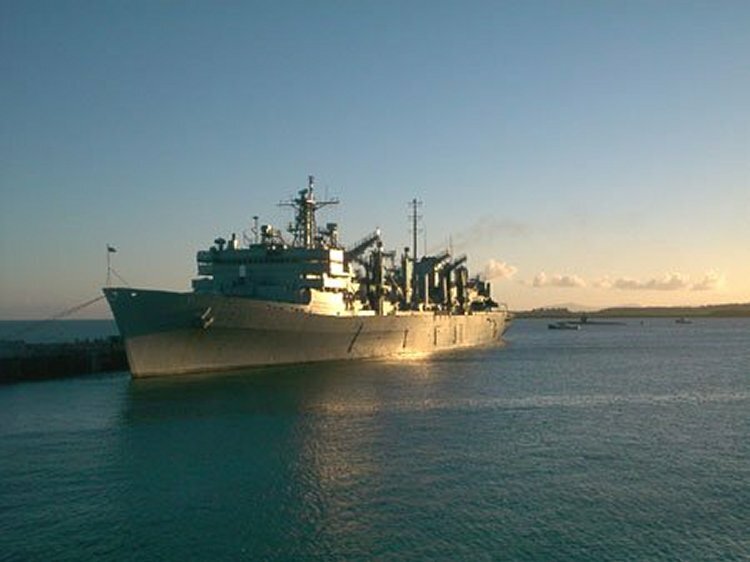 382k USNS Arctic (T-AOE-8) executes a berth shift during a brief port visit to Souda Bay, Crete, Greece. 104k USS Harry S. Truman (CVN-75), center, sails alongside USNS Arctic (T-AOE-8) followed by USS Enterprise (CVN-65), right, and USS Dwight D. Eisenhower (CVN-69), left, during an early morning vertical replenishment and underway replenishment in the Atlantic Ocean, November 3, 2005. 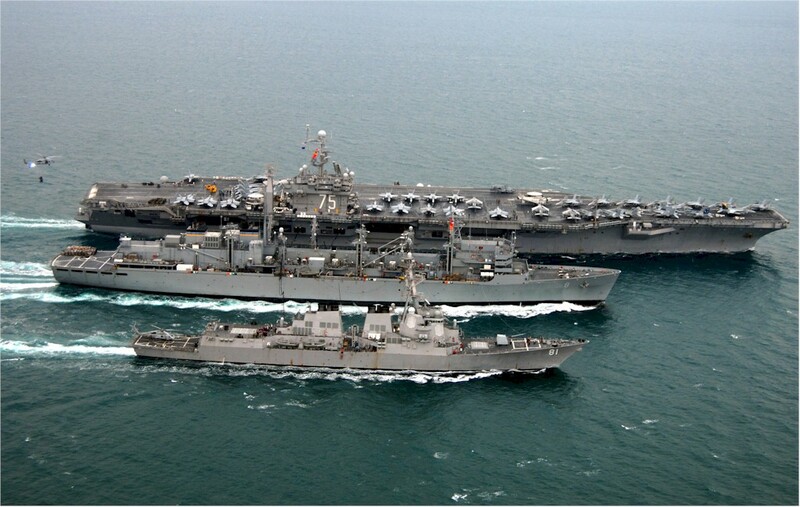 165k USS Dwight D. Eisenhower (CVN-69), foreground, steams alongside USNS Arctic (T-AOE 8) as she conducts an underway replenishment with USS Harry S. Truman (CVN-75), 3 November 2005. 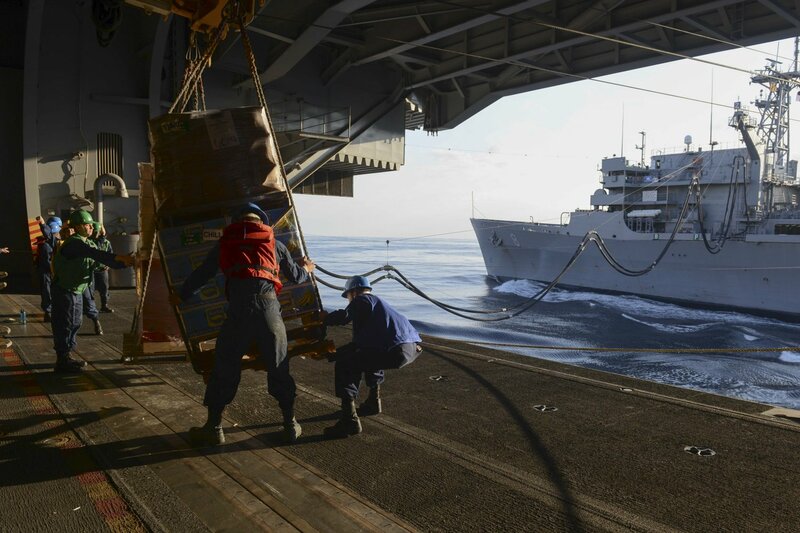 Both carriers were underway in the Atlantic Ocean conducting ammunition offloads and underway replenishments . 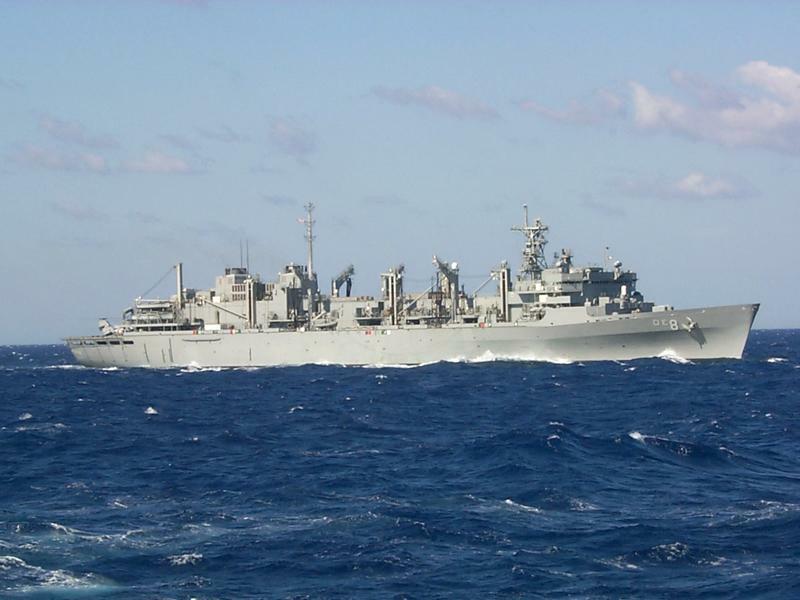 124k USNS Arctic (T-AOE-8) underway in the Atlantic Ocean, 6 May 2006, with guided-missile cruiser USS Anzio (CG-68), and guided-missile destroyer USS Ramage (DDG-61) followed by guided-missile destroyer USS Mason (DDG-87). 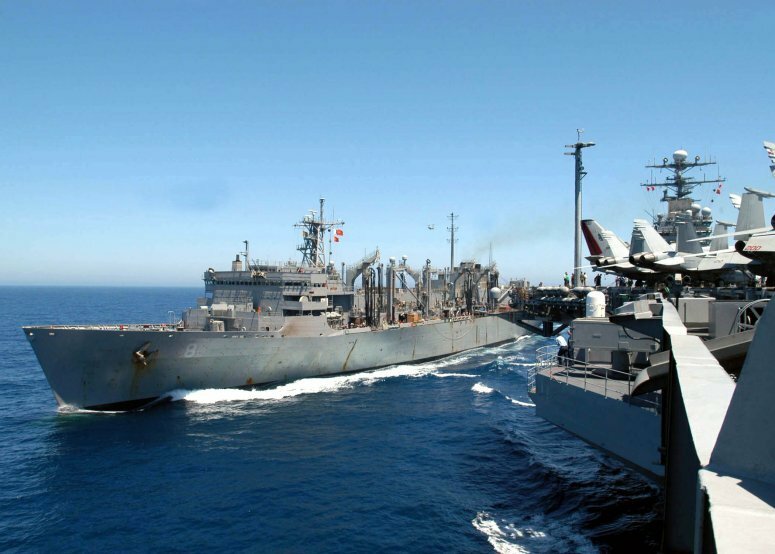 The ships were participating in Composite Training Unit Exercise (COMPTUEX) as part of the Eisenhower Carrier Strike group. 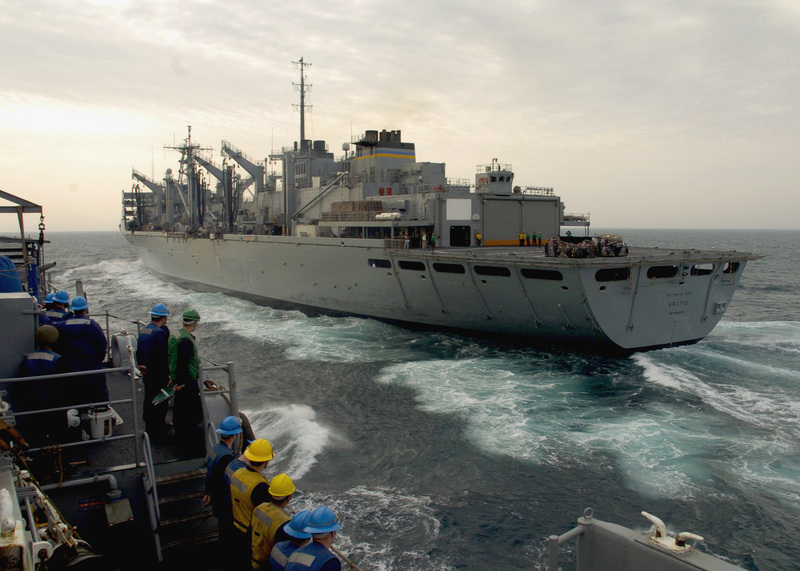 85k USS Iwo Jima (LHD-7) pulls alongside USNS Arctic (T-AOE-8) during a replenishment at sea (RAS), somewhere in the Atlantic Ocean, 11 June 2006. 96k An MH-60S Seahawk helicopter, assigned to the "Dragon Whales" of Helicopter Sea Combat Squadron Two Eight (HSC-28), picks up ordnance from the deck of USNS Arctic (T-AOE-8) during a vertical replenishment (VERTREP) with the Nimitz class aircraft carrier USS Dwight D. Eisenhower (CVN-69), 7 September 2006. 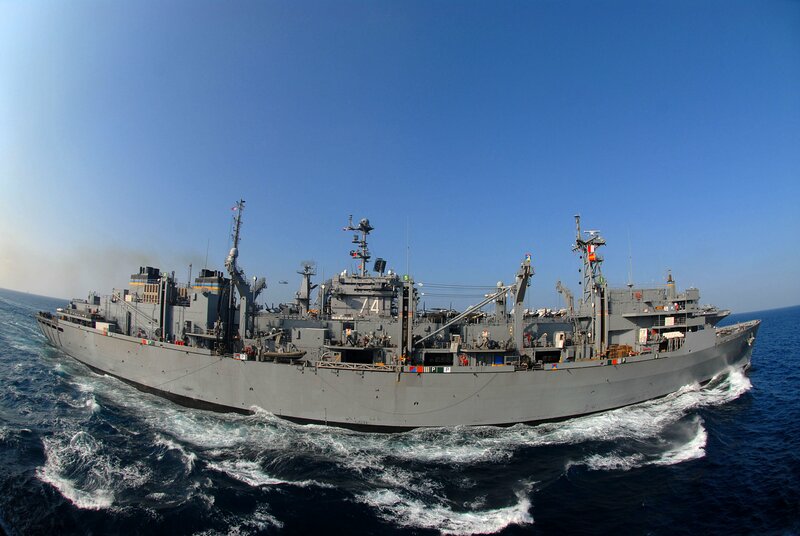 110k USNS Arctic (T-AOE-8) conducts a replenishment at sea (RAS) with USS Dwight D. Eisenhower (CVN-69) in the Persian Gulf, 16 December 2006. 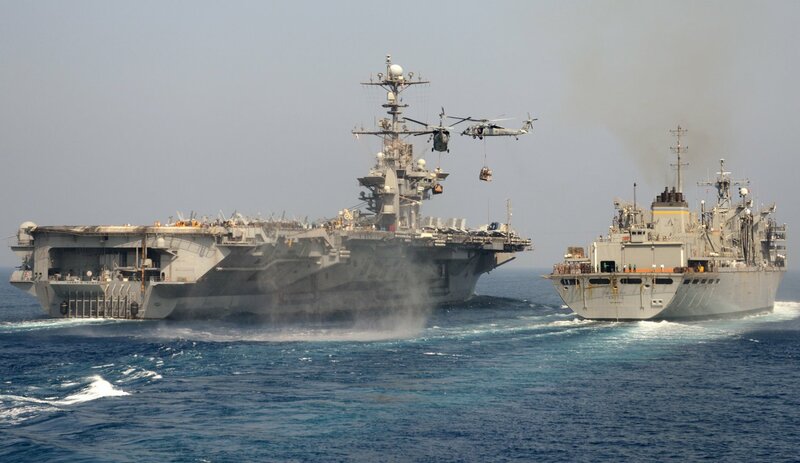 The Nimitz-class aircraft carrier and embarked Carrier Air Wing Seven (CVW-7) were on a regularly scheduled deployment in support of Maritime Security Operations and the global war on terrorism. 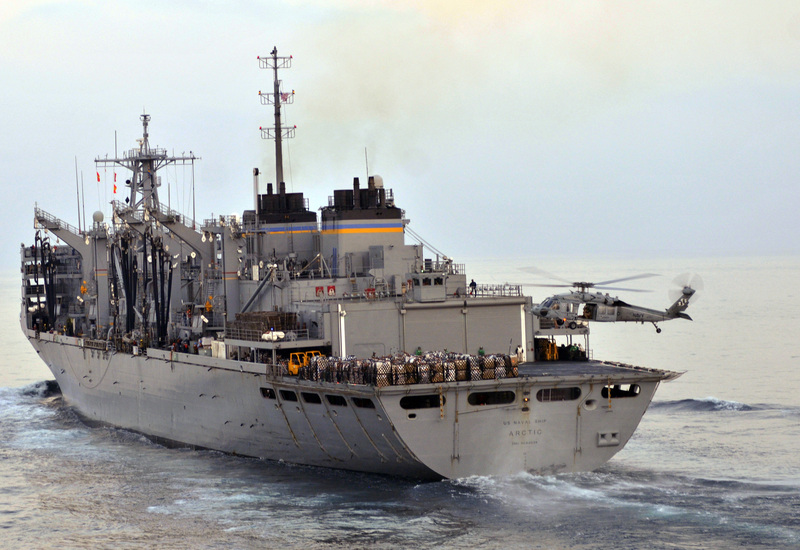 106k USNS Arctic (T-AOE-8) conducting an underway replenishment with the Nimitz-class aircraft carrier USS Dwight D. Eisenhower (CVN 69), 15 January 2007. 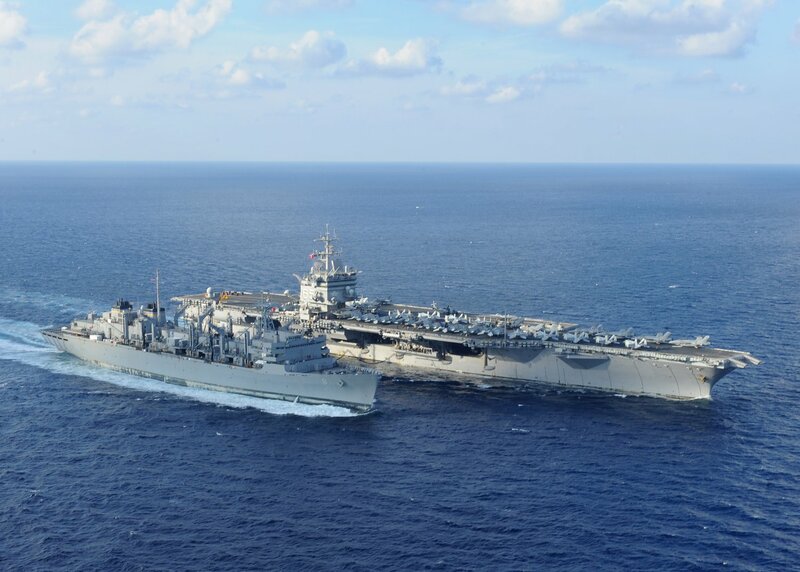 Eisenhower and embarked Carrier Air Wing Seven (CVW-7) are on a regularly scheduled deployment in support of Maritime Security Operations (MSO). 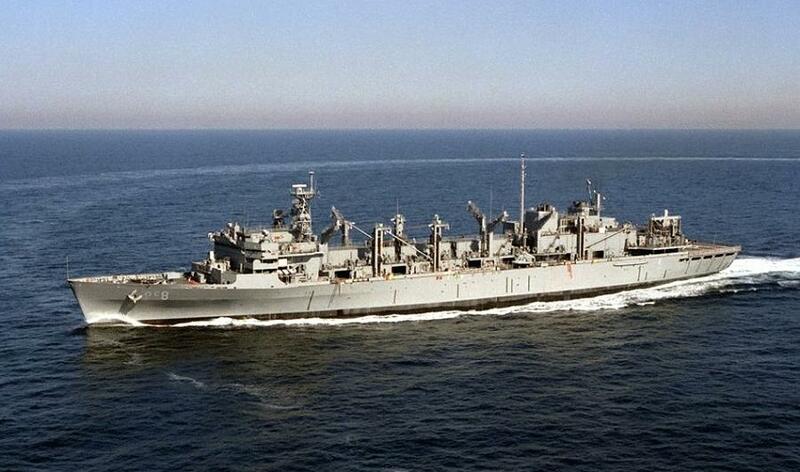 This was a rare six-station Replenishment At Sea (RAS). 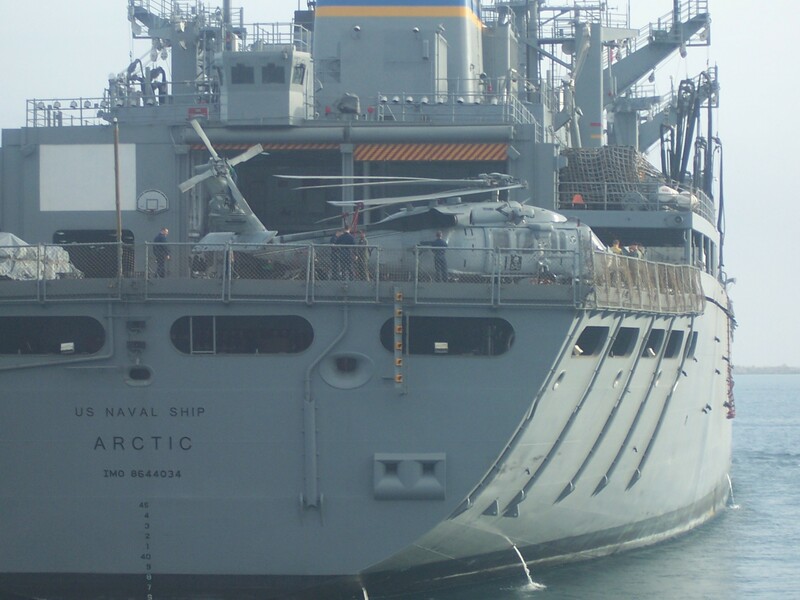 Because there are not many ships equipped to support an aircraft carrier with a six-station RAS, replenishments of that magnitude are highly uncommon. 229k Overhead view of USS Arctic (T-AOE-8) while conducting an underway replenishment with the Nimitz-class aircraft carrier USS Dwight D. Eisenhower (CVN 69), 15 January 2007. 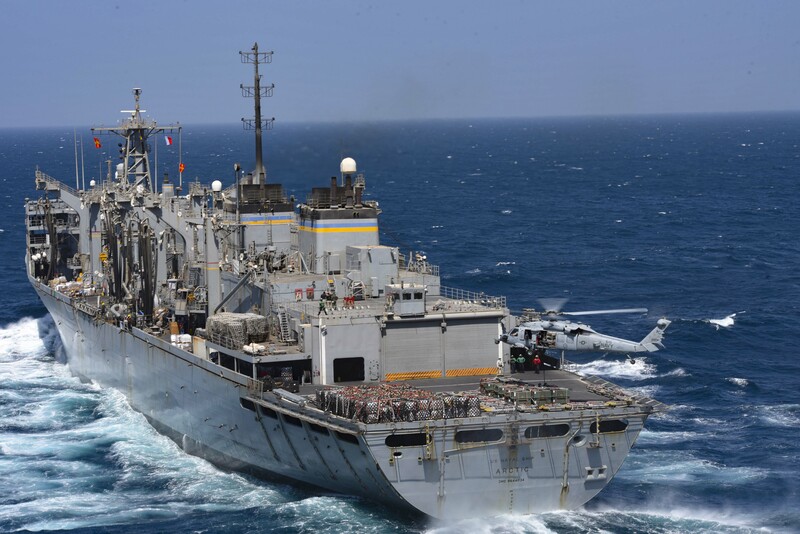 Eisenhower and embarked Carrier Air Wing Seven (CVW-7) are on a regularly scheduled deployment in support of Maritime Security Operations (MSO). 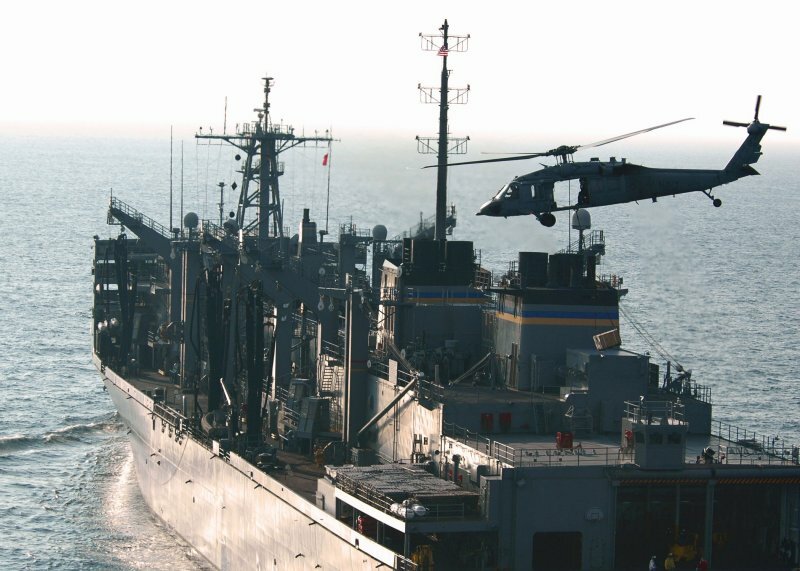 82k An MH-60 Seahawk assigned to the "Dragon Whales" of Helicopter Sea Combat Squadron (HSC-28) transfers cargo from USNS Arctic (T-AOE-8) to USS Dwight D. Eisenhower (CVN-69) during an underway replenishment, 16 February 2007. Eisenhower and embarked Carrier Air Wing (CVW-7) are on a regularly scheduled deployment in support of Maritime Security Operations (MSO). 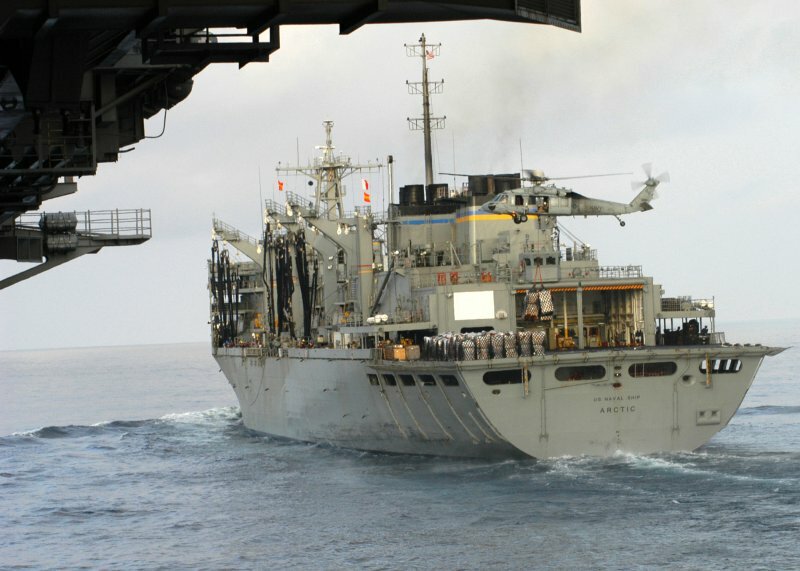 1072k USNS Arctic (T-AOE-8) conducts an underway replenishment to transfer fuel and supplies to the Nimitz-Class aircraft carrier USS John C. Stennis (CVN-74), 20 February 2007. The John C. Stennis Carrier Strike Group, is on a regularly scheduled deployment in support of Maritime Security Operations (MSO). MSO help set the conditions for security and stability, as well as aid counter-terrorism and security efforts to the regional nations. 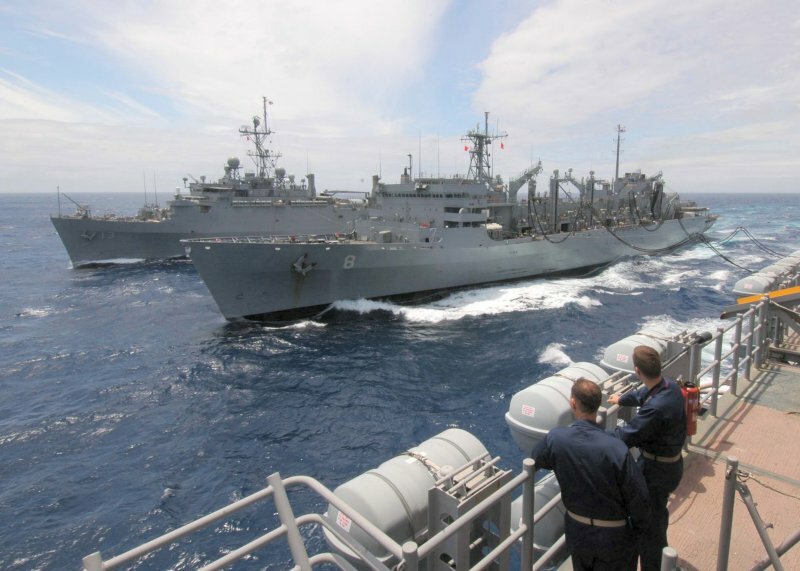 649k USNS Arctic (T-AOE-8) transits alongside Nimitz-class aircraft carrier USS Harry S. Truman (CVN-75) while preparing for a replenishment at sea. Truman is a part of Carrier Strike Group (CSG) 10 and is en route to the Central Command area of responsibility as part of the ongoing rotation to support maritime security operations in the region. 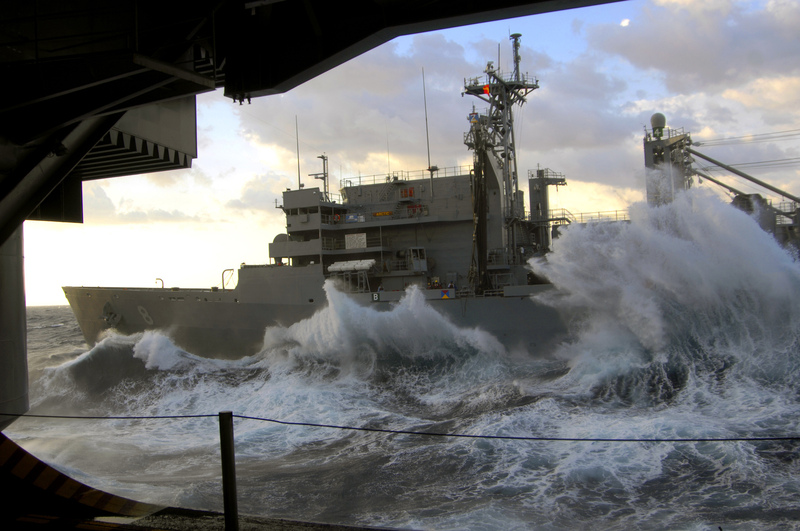 917k Rough seas pound USNS Arctic (T-AOE-8) as she sails alongside the nuclear-powered aircraft carrier USS Harry S. Truman (CVN-75) while preparing for a replenishment at sea, 6 November 2007. Truman is part of Carrier Strike Group 10 and is enroute to the Central Command Area of responsibility as part of the ongoing rotation to support maritime security operations in the region. 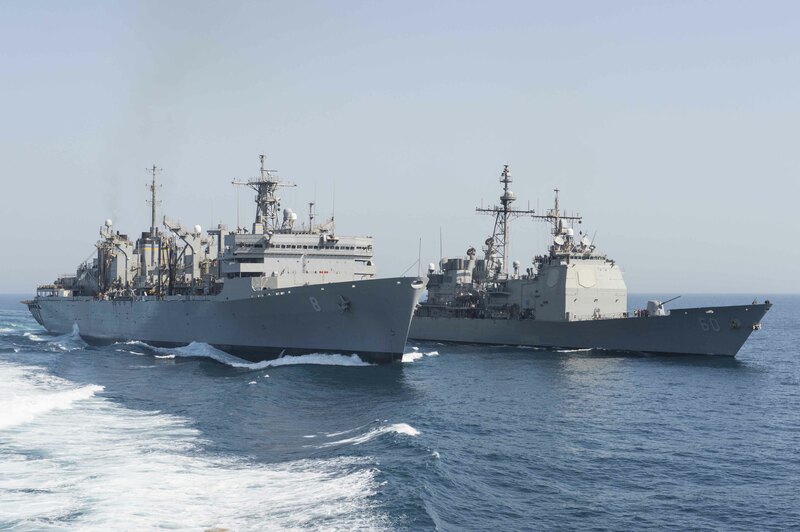 649k USNS Arctic (T-AOE-8), center, replenishes the Nimitz-class nuclear powered aircraft carrier USS Harry S. Truman (CVN-75) and the Arleigh Burke-class guided-missile destroyer USS Winston S. Churchill (DDG-81) while underway in the Persian Gulf, 23 January 2008. 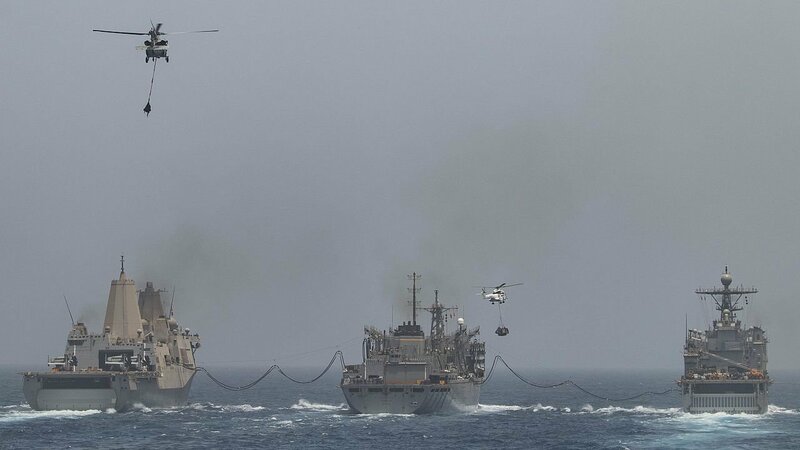 781k An MH-60S Seahawk, attached to the "Sea Knights" of Helicopter Sea Combat Squadron (HSC-22), performs a vertical replenishment (VERTREP) with USNS Arctic (T-AOE-8) and the Nimitz-class nuclear-powered aircraft carrier USS Harry S. Truman (CVN-75). 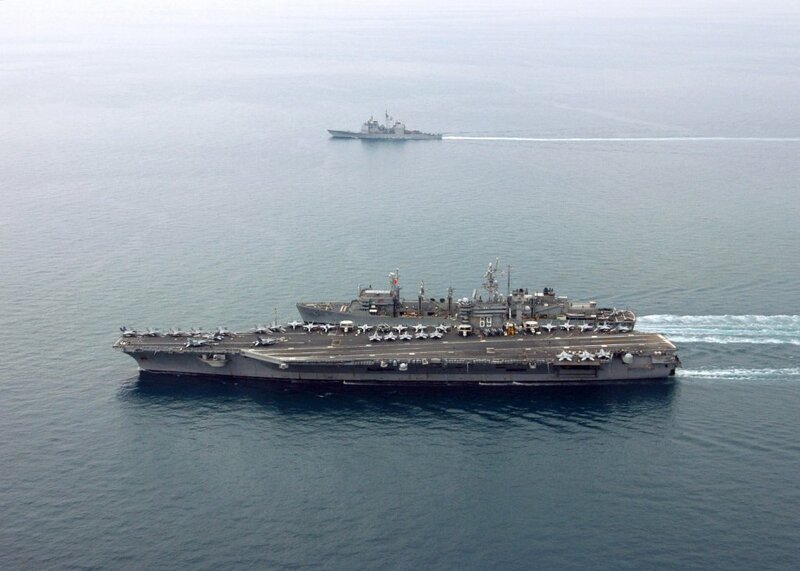 Truman and embarked Carrier Air Wing (CVW3) are on a scheduled deployment in support of Operations Iraqi Freedom, Enduring Freedom and maritime security operations. 689k Sailors aboard the amphibious transport dock USS Cleveland (LPD-7) prepare for an underway replenishment with USNS Arctic (T-AOE-8). 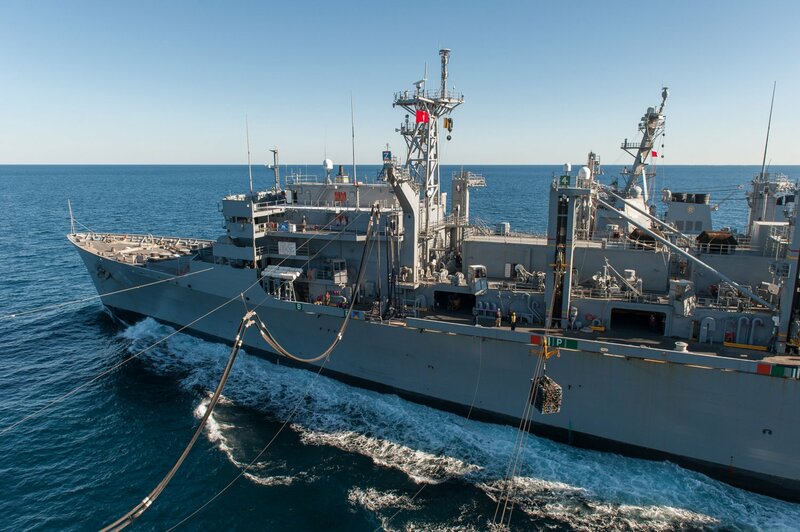 The Cleveland is deployed to the US 5th Fleet area of responsibility and is working with coalition forces to maintain a naval and air presence in the region to deter de-stabilizing activities and safeguard the region's vital links to the global economy. 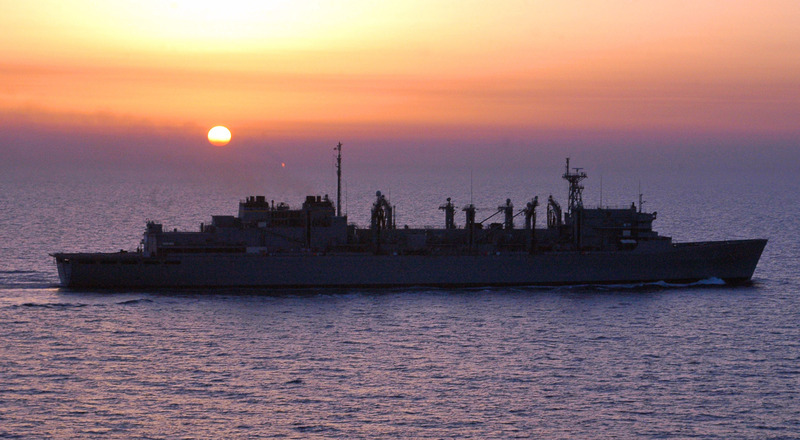 914k USNS Arctic (T-AOE-8) underway at dusk in the Persian Gulf, 8 March 2008. 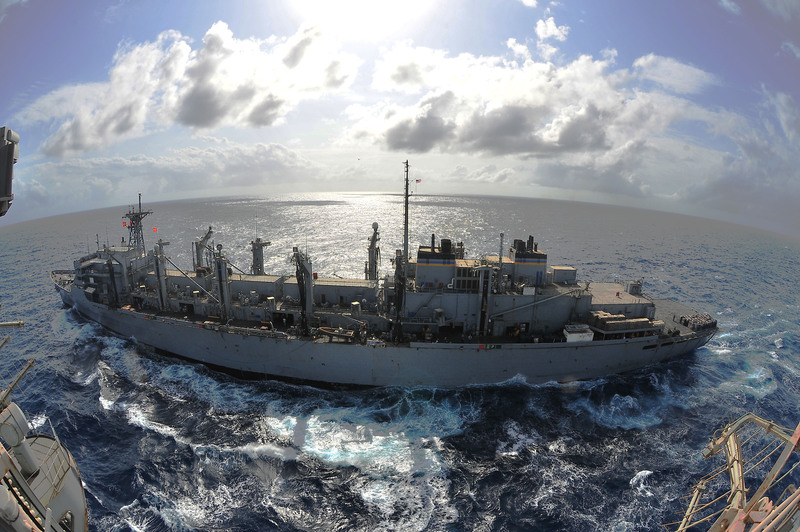 734k USNS Arctic (T-AOE-8) comes alongside USS Theodore Roosevelt (CVN 71) during an ammunition offload. 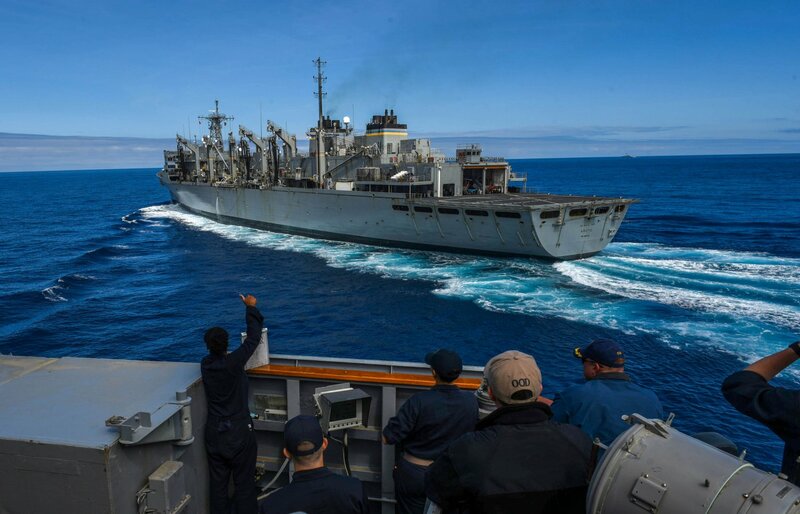 287k USNS Arctic (T-AOE-8) completes an underway replenishment with USS George H. W. Bush (CVN 77) George H. W. Bush is conducting training in the Atlantic Ocean. 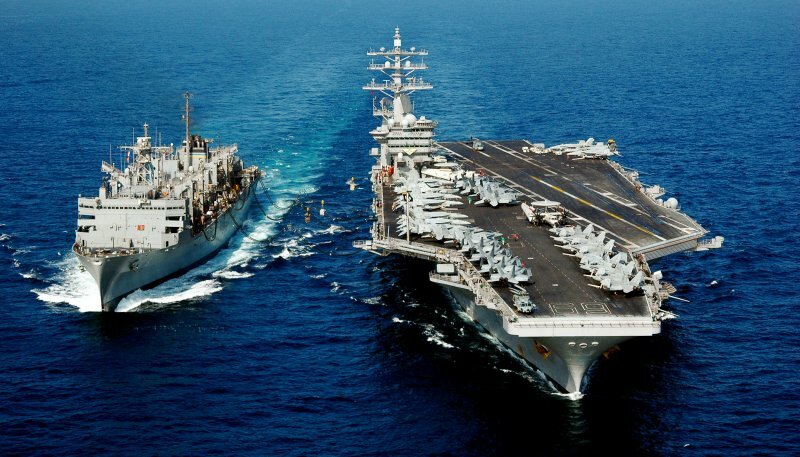 1506k The aircraft carrier USS George H. W. Bush (CVN 77) pulls alongside USNS Arctic (T-AOE-8) for a refueling at sea. 282k USNS Arctic (T-AOE-8) breaks away from USS George H. W. Bush (CVN 77) George H. W. Bush is conducting training in the Atlantic Ocean. 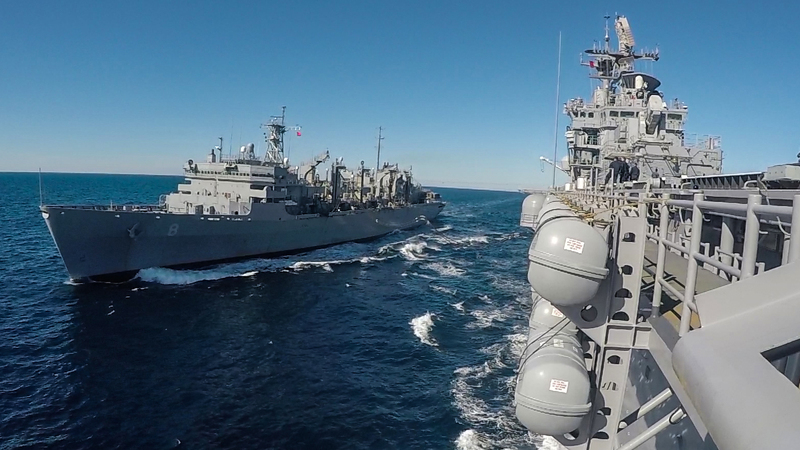 253k USNS Arctic (T-AOE-8) and the aircraft carrier USS Enterprise (CVN-65) conduct an underway replenishment. Enterprise Carrier Strike Group is conducting a composite training unit exercise in preparation for an upcoming deployment. 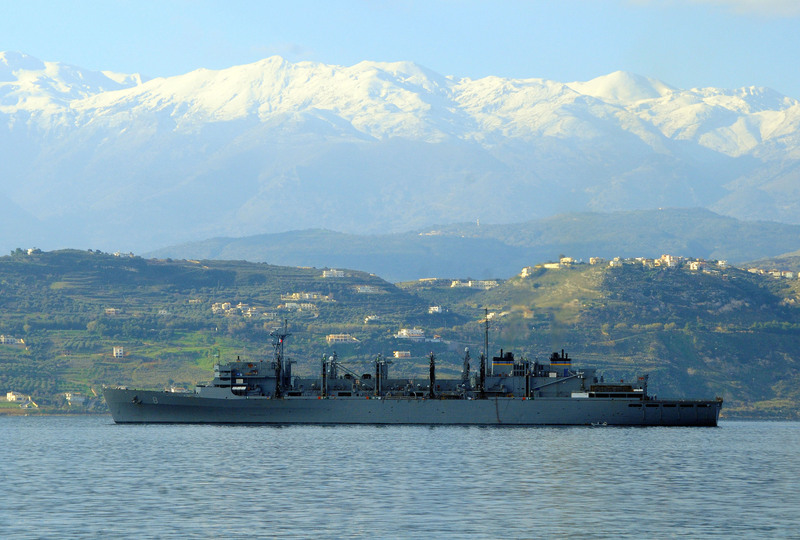 1193k USNS Arctic (T-AOE-8) departs Souda Bay after a scheduled port visit. 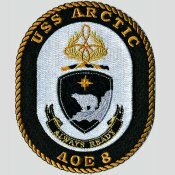 Arctic is one of four Military Sealift Command fast combat support ships and is part of the 41 ships in the Naval Fleet Auxiliary Force. 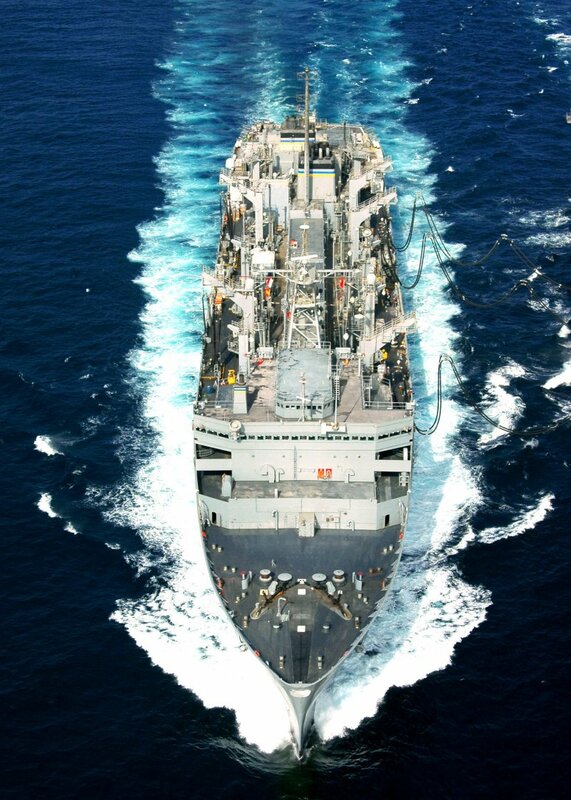 1265k USNS Arctic (T-AOE-8) prepares to unload JP5 jet fuel during an underway replenishment with the aircraft carrier USS Enterprise (CVN-65). Enterprise and Carrier Air Wing (CVW-1) are on deployment in the U.S. 5th Fleet area of responsibility to conduct maritime security operations. 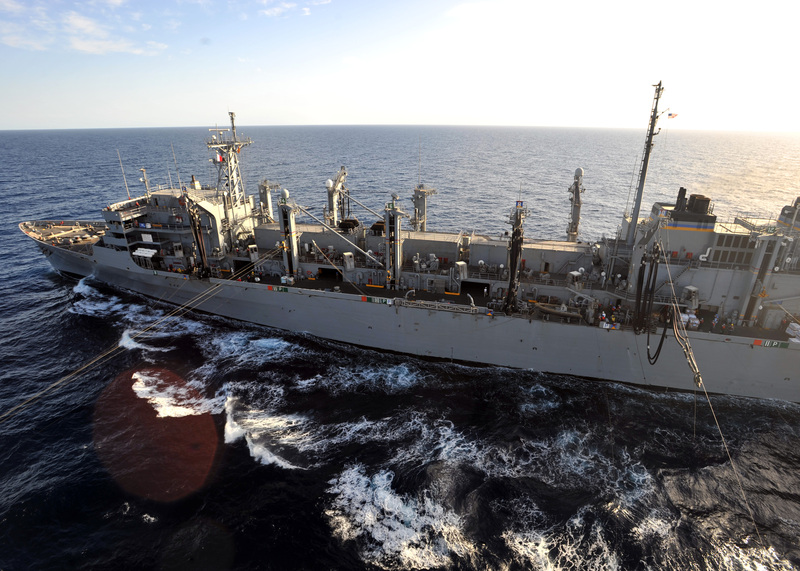 2069k USNS Arctic (T-AOE-8) approaches the aircraft carrier USS Enterprise (CVN-65) during an underway replenishment. Enterprise and Carrier Air Wing (CVW-1) are conducting close-air support missions in the US 5th Fleet area of responsibility. 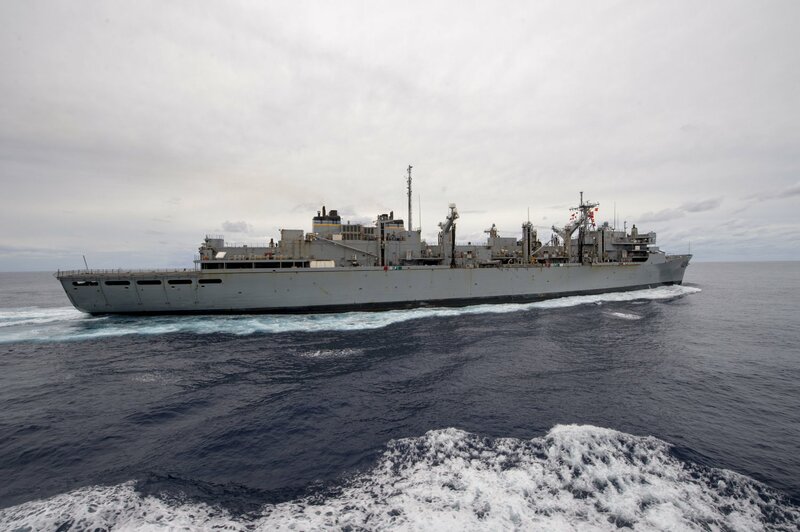 3327k USNS Arctic (T-AOE-8) prepares to come alongside the aircraft carrier USS Enterprise (CVN-65) to perform an underway replenishment. Enterprise and Carrier Air Wing (CVW-1) are conducting close-air support missions in the US 5th Fleet area of responsibility. 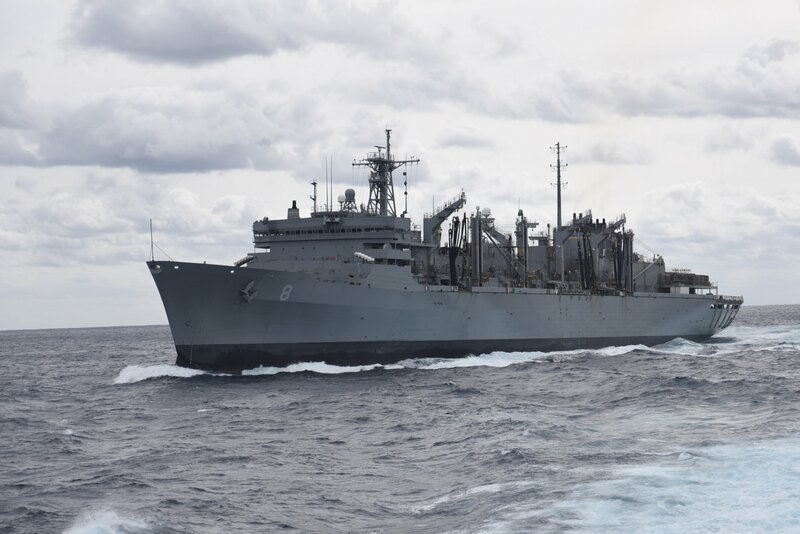 2017k USNS Arctic (T-AOE-8) pulls alongside the aircraft carrier USS Enterprise (CVN-65) to conduct an underway replenishment. Enterprise and Carrier Air Wing (CVW-1) are conducting maritime security operations in the US 5th Fleet area of responsibility. 607k CDR. Cole Hayes, left, commanding officer of the amphibious transport dock ship USS Ponce (LPD-15), and Sailors aboard the ship man the port bridge wing as the ship approaches USNS Arctic (T-AOE-8) for the final scheduled underway replenishment before decommissioning. 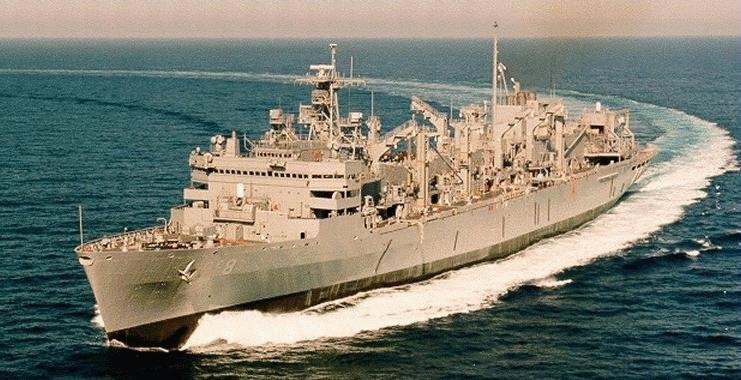 Ponce is en route to Port Canaveral, FL., the first of her final three ports of call, before beginning the decommissioning process after 41 years of service. 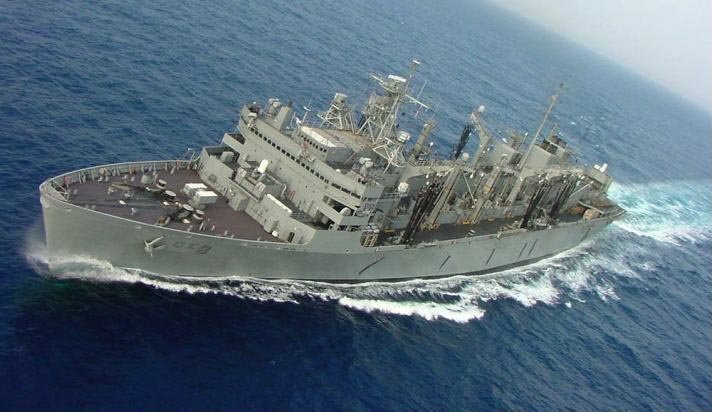 392k USNS Arctic (T-AOE-8) maneuvers away from the amphibious transport dock ship USS Ponce (LPD-15) after completing Ponce's final scheduled underway replenishment before decommissioning. 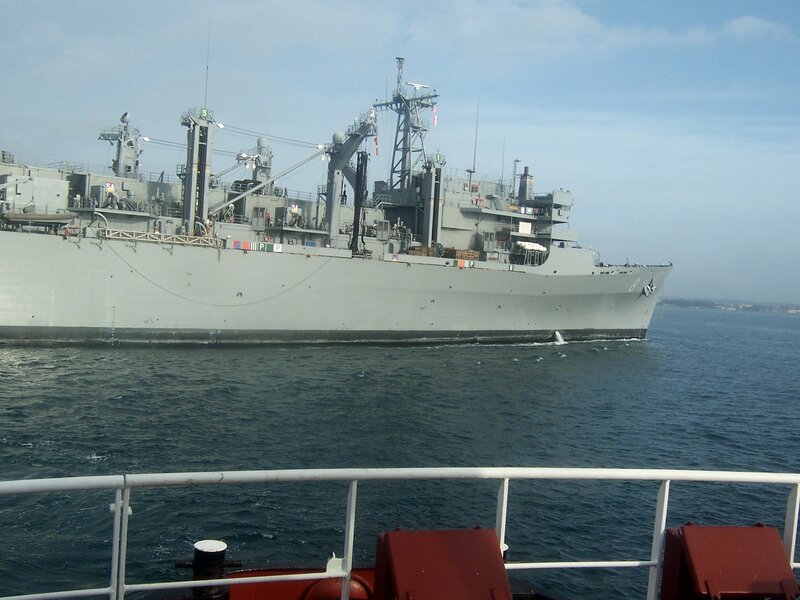 188k USNS Arctic (T-AOE-8) moored at Naval Station Norfolk, VA., in December 2012. Richard Miller BMCS USNR Ret. 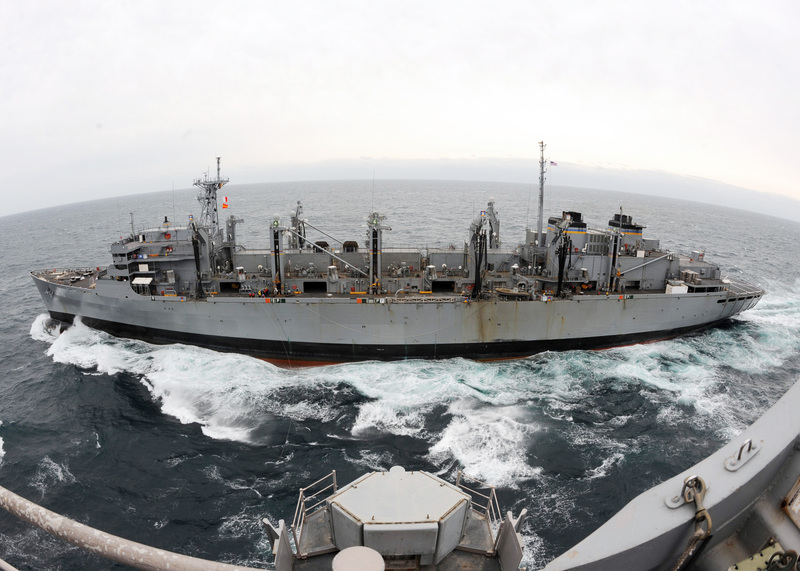 307k USNS Arctic (T-AOE-8) conducts an underway replenishment with a French navy ship. 303k Sailors secure cargo from USNS Arctic (T-AOE 8) in the hangar bay of the aircraft carrier USS Harry S. Truman (CVN-75) during a replenishment-at-sea. 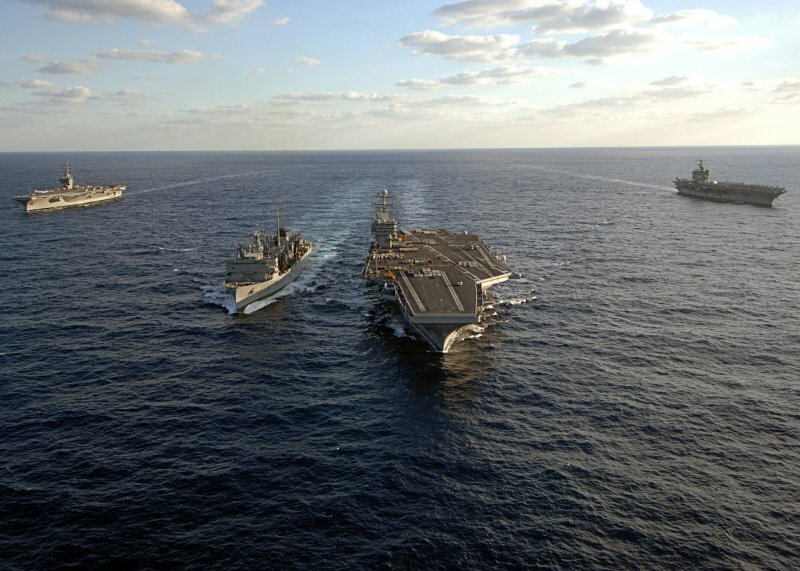 The Harry S. Truman Carrier Strike Group, is deployed to the U.S. 5th Fleet area of responsibility conducting maritime security operations, supporting theater security cooperation efforts and supporting Operation Enduring Freedom. 298k An MH-60S Knighthawk helicopter, assigned to the "Sea Knights" of Helicopter Sea Combat Squadron 22 (HSC-22), picks up cargo from USNS Arctic (T-AOE-8) during a replenishment-at-sea with the aircraft carrier USS Harry S. Truman (CVN-75). 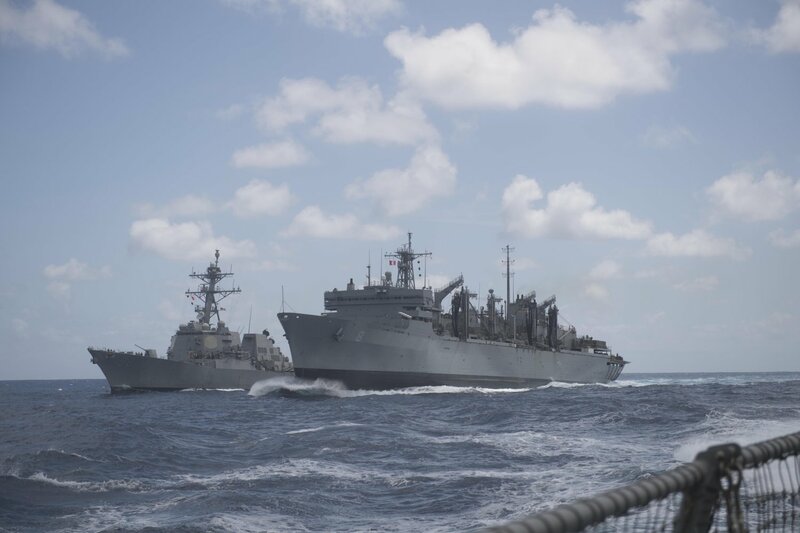 The Truman Carrier Strike Group, is deployed to the U.S. 5th Fleet area of responsibility conducting maritime security operations, supporting theater security operations and supporting Operation Enduring Freedom. 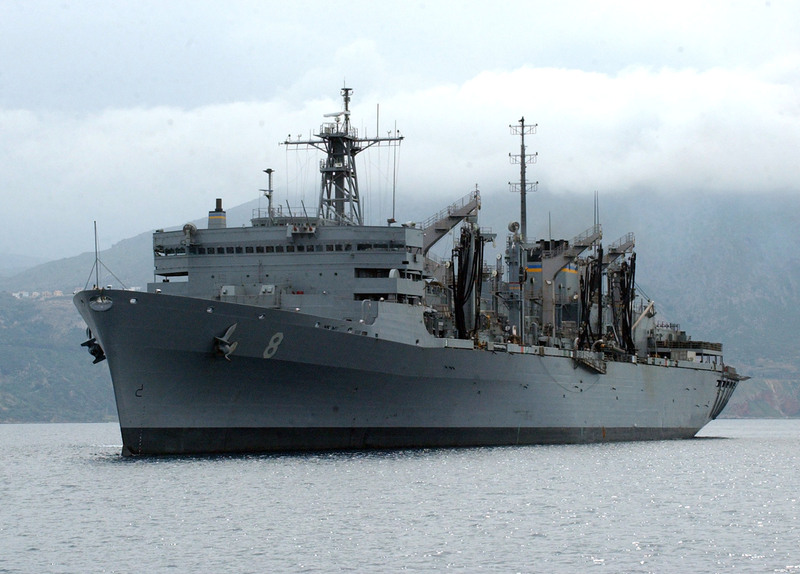 341k USNS Arctic (T-AOE-8) transfers cargo to the aircraft carrier USS Harry S. Truman (CVN-75). 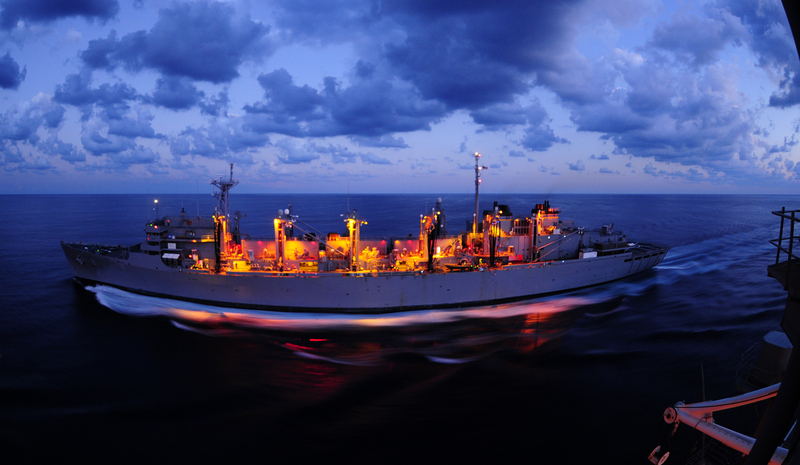 Harry S. Truman, during a replenishment-at-sea. 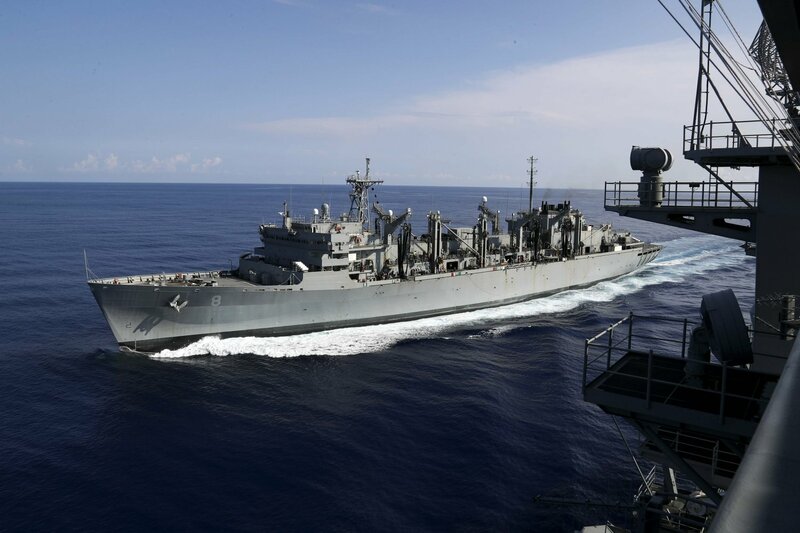 Harry S. Truman, flagship for the Harry S. Truman Carrier Strike Group, is deployed to the U.S. 5th Fleet area of responsibility conducting maritime security operations and supporting theater security cooperation efforts. 140325-N-ZG705-050 RED SEA (March 25, 2014) 209k An MH-60S Knighthawk helicopter, assigned to the "Sea Knights" of Helicopter Sea Combat Squadron 22 (HSC-22), transfers cargo from USNS Arctic (T-AOE-8) during a replenishment-at-sea with the aircraft carrier USS Harry S. Truman (CVN-75) as seen from seen guided-missile destroyer USS Bulkeley (DDG-84). 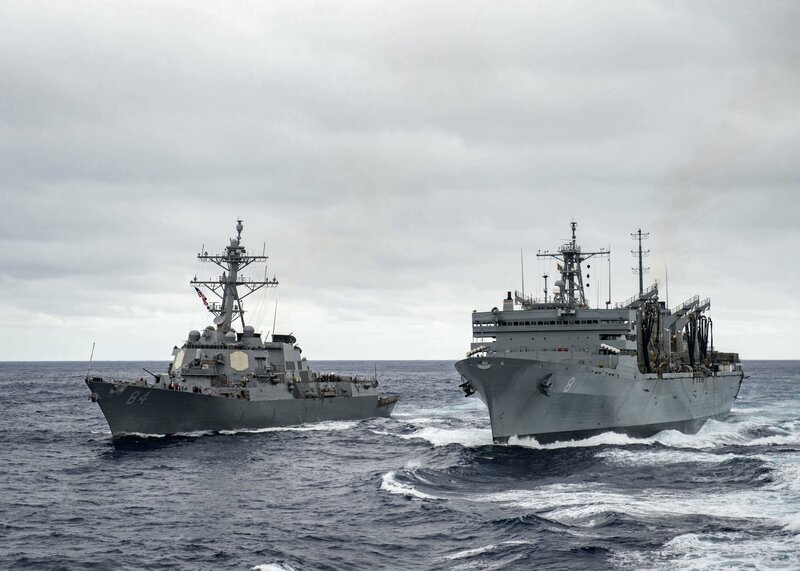 Harry S. Truman, flagship for the Harry S. Truman Carrier Strike Group, and Bulkeley are deployed to the U.S. 5th Fleet area of responsibility conducting maritime security operations and supporting theater security cooperation efforts. 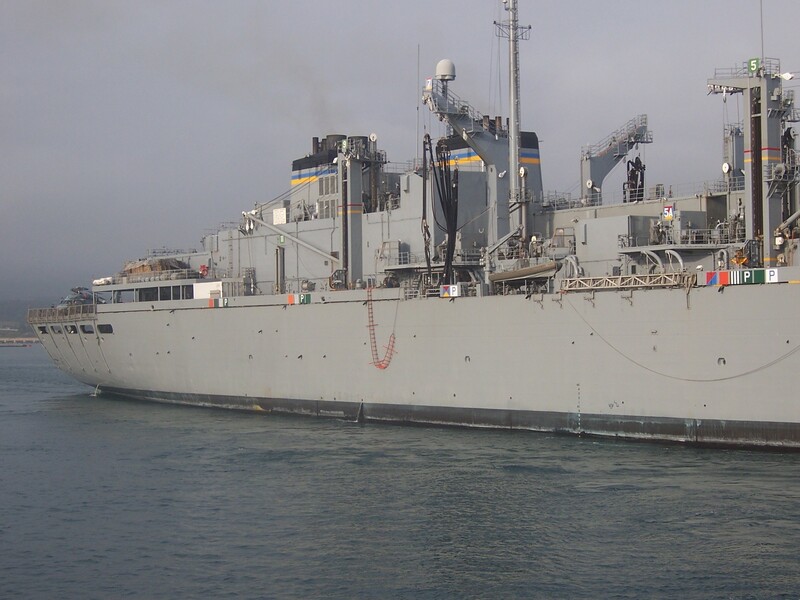 196k USNS Arctic (T-AOE-8) transits beside the aircraft carrier USS Theodore Roosevelt (CVN-71), not pictured, in preparation for a replenishment-at-sea. 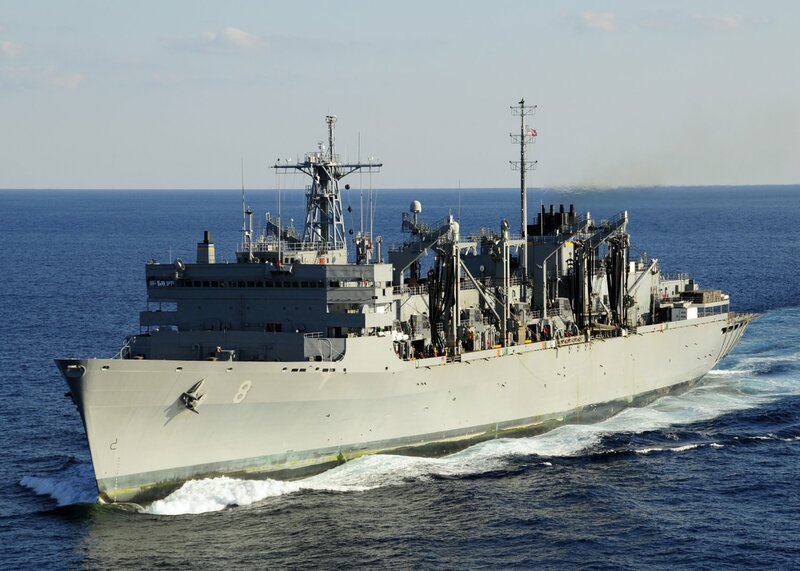 Theodore Roosevelt is underway participating in a composite training unit exercise, which tests the Theodore Roosevelt Carrier Strike Group's ability to effectively react to real-world scenarios and perform as an integrated unit. 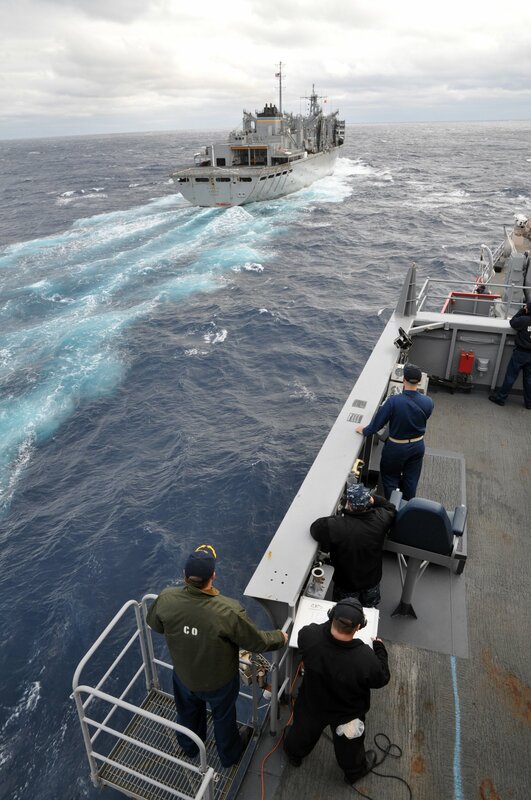 1149k U.S. Navy guided-missile destroyer USS Winston S. Churchill (DDG-81), not visible, conducts a replenishment-at-sea with USNS Arctic (T-AOE-8) in the Atlantic Ocean. 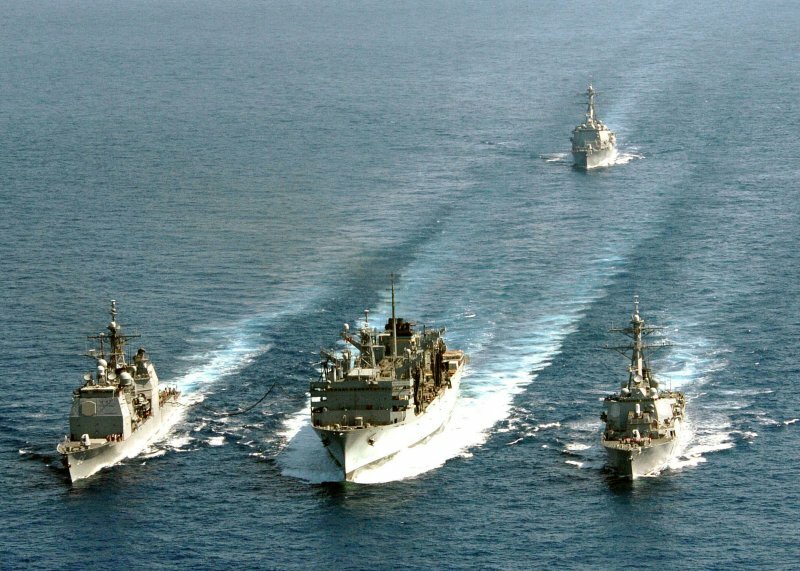 Churchill was under way conducting a composite training unit exercise along with the Theodore Roosevelt Carrier Strike Group in preparation for an upcoming scheduled deployment. 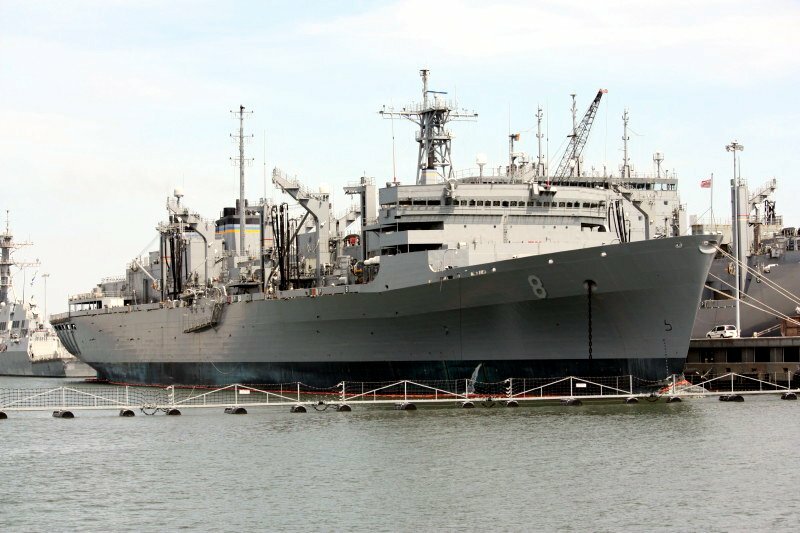 88k USNS Arctic (T-AOE-8) moored pierside at NOB Norfolk, VA., date unknown. 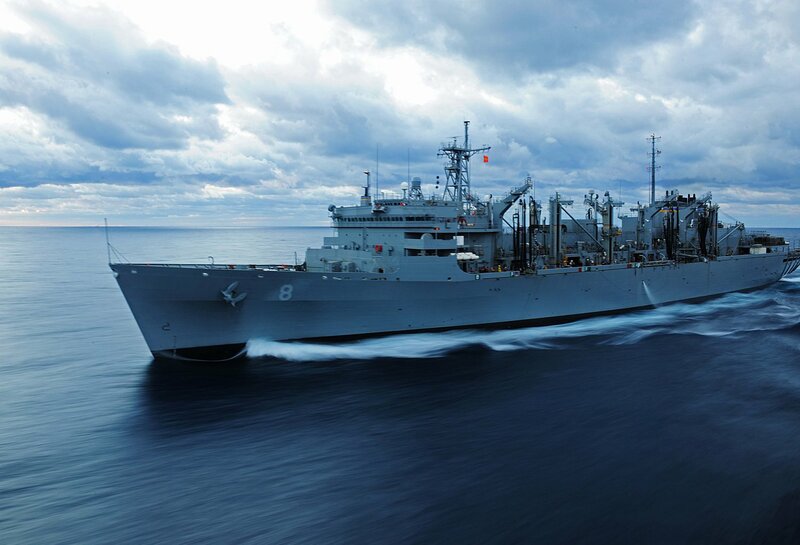 508k USNS Arctic (T-AOE-8) conducts an underway replenishment with the guided-missile cruiser USS Normandy (CG-60). Normandy is deployed to the U.S. 5th Fleet area of operations as part of Theodore Roosevelt Carrier Strike Group supporting Operation Inherent Resolve, strike operations in Iraq and Syria as directed, maritime security operations and theater security cooperation efforts in the region. 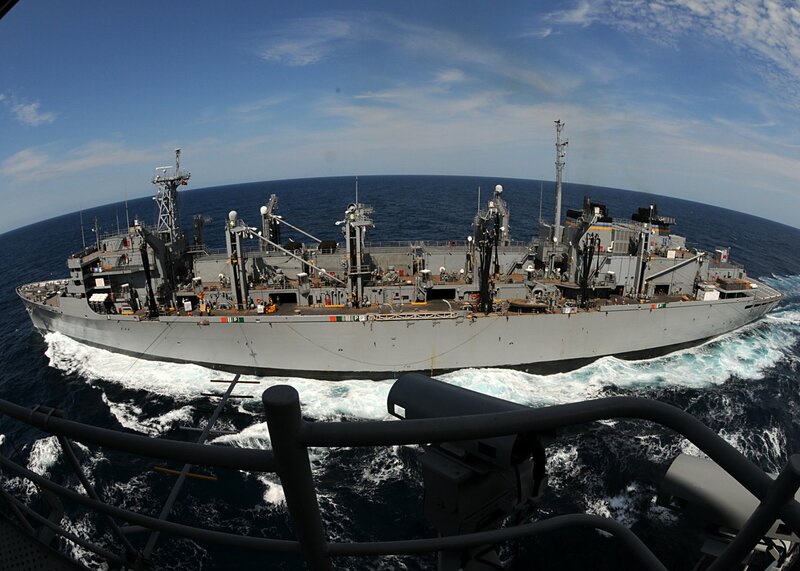 820k USNS Arctic (T-AOE-8) conducts a replenishment-at-sea with the amphibious assault ship USS Bataan (LHD-5). 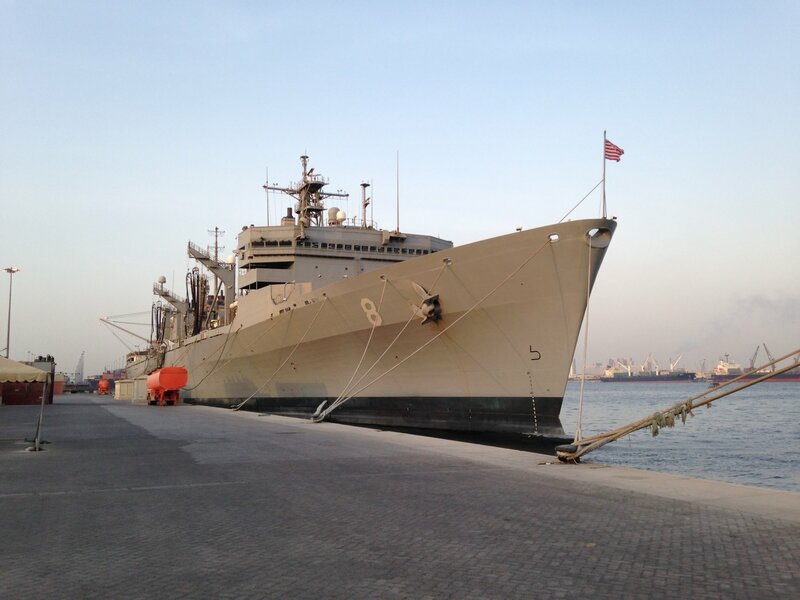 Bataan is currently completing a maintenance availability period. 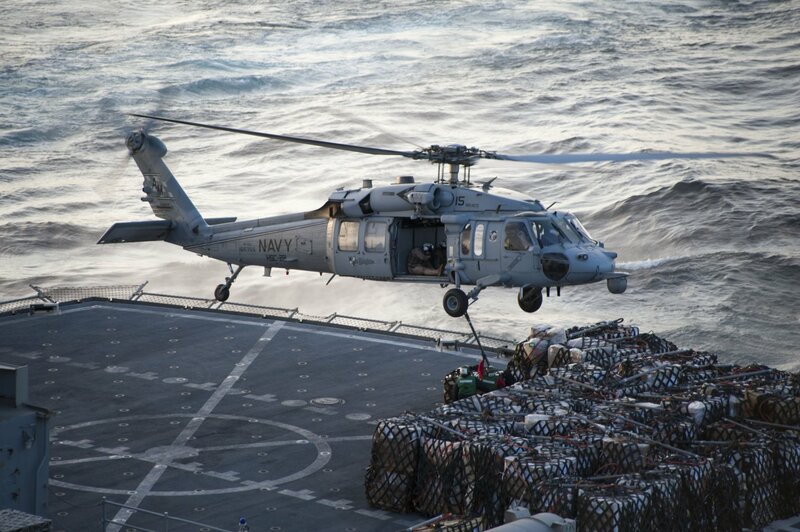 1581k An MH-60S Sea Hawk helicopter assigned to the Dusty Dogs of Helicopter Sea Combat Squadron (HSC) 7 prepares to transport supplies from the helicopter deck of USNS Arctic (T-AOE-8) to the aircraft carrier USS Dwight D. Eisenhower (CVN-69). 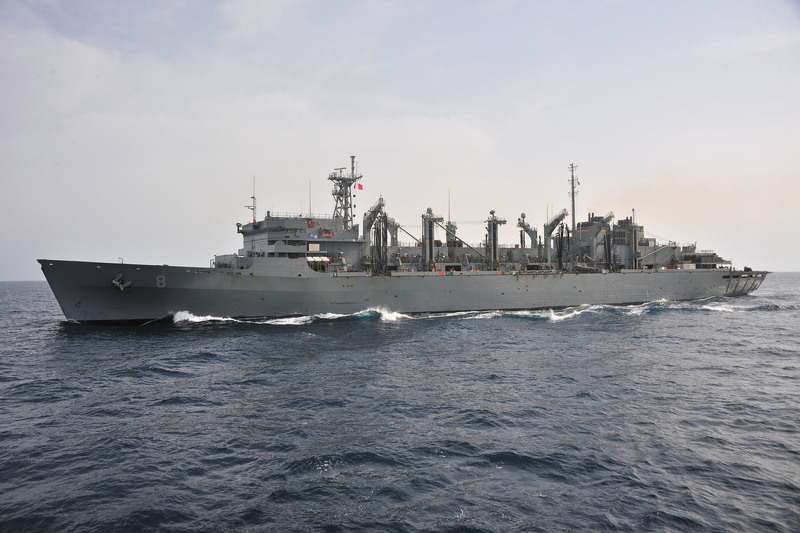 The ship and its Carrier Strike Group are deployed in support of Operation Inherent Resolve, maritime security operations and theater security cooperation efforts in the U.S. 5th Fleet area of operations. 216k USNS Arctic (T-AOE-8) pulls away from the Nimitz-class aircraft carrier USS Harry S. Truman (CVN-75) after a replenishment-at-sea. Harry S. Truman has successfully completed her composite training unit exercise, certifying the ship and its carrier strike group for deployment. 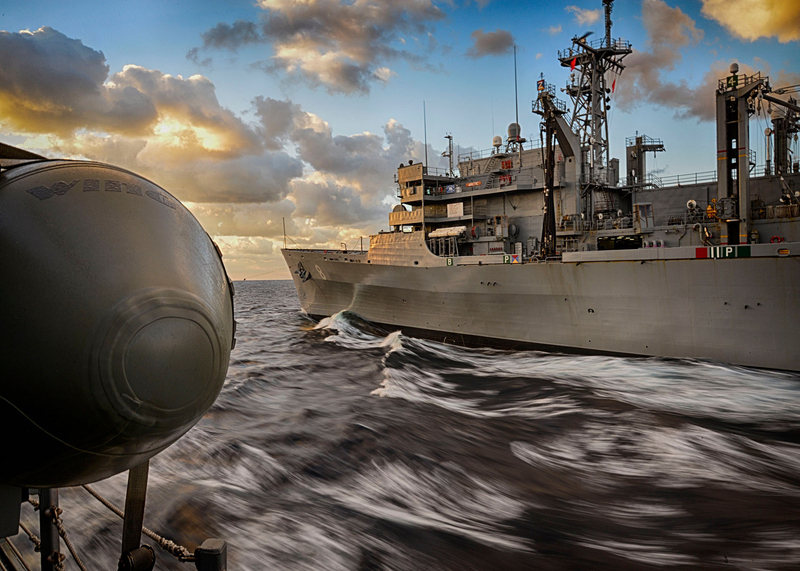 241k USNS Arctic (T-AOE-8) conducts a replenishment-at-sea with the guided-missile destroyer USS Bulkeley (DDG-84). 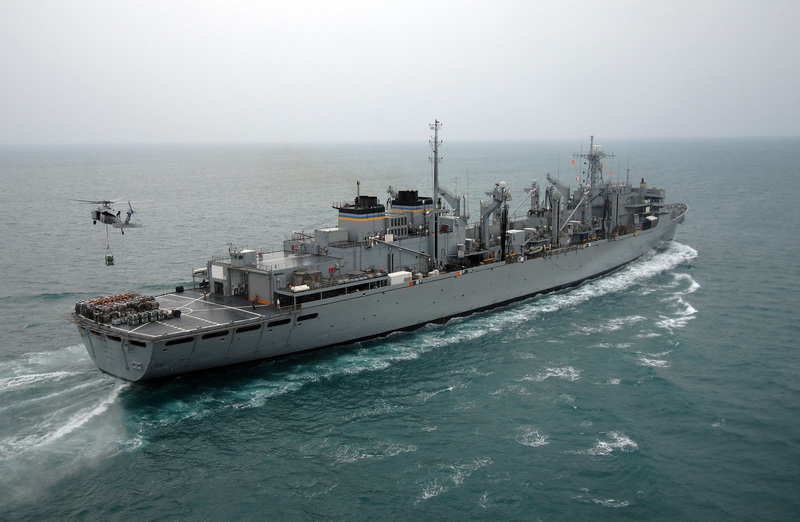 Bulkeley is deployed as part of the Harry S. Truman Carrier Strike Group. With USS Harry S. Truman (CVN-75) as the flagship, deployed strike group units include staffs, ships and aircraft of Carrier Strike Group EIGHT (CSG 8), Destroyer Squadron TWO EIGHT (DESRON 28) and Carrier Air Wing ONE (CVW-1); as well as Sachsen-class German Frigate FGS Hessen (F221). 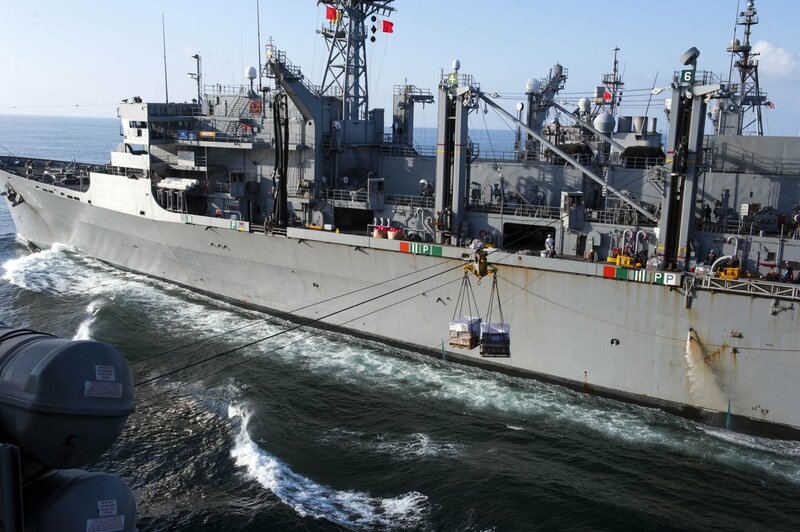 154k The guided-missile destroyer USS Forrest Sherman (DDG-98), left, receives fuel from USNS Arctic (T-AOE-8) during an underway replenishment. Forrest Sherman is deployed with the Harry S. Truman Carrier Strike Group. 243k Sailors stand on the bridge wing of the Arleigh Burke-class guided-missile destroyer USS Laboon (DDG-58) as the ship approaches USNS Arctic (T-AO-8), 14 July 2018. 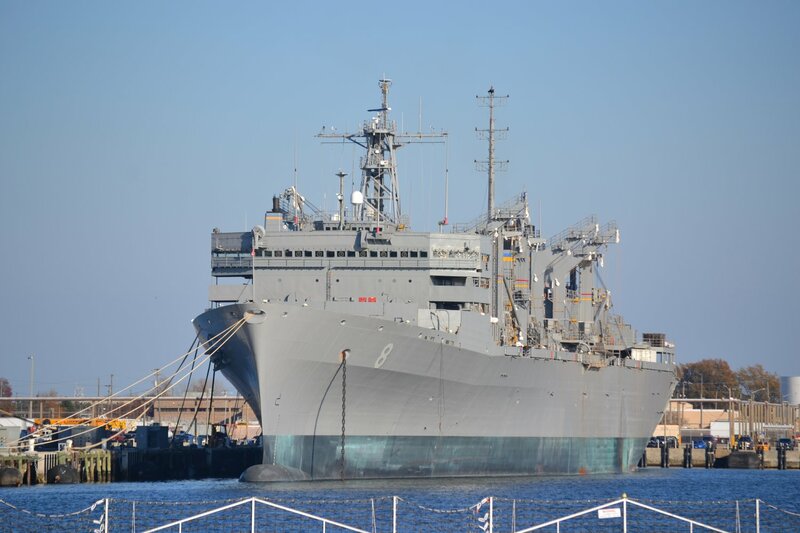 Laboon, home-ported in Naval Station Norfolk, is in the U.S. 6th Fleet area of operations in support of regional allies and partners and U.S. national security interests in Europe and Africa. 227k USNS Arctic (T-AOE-8) breaks away from the Nimitz-class aircraft carrier USS Abraham Lincoln (CVN-72) following an underway replenishment. 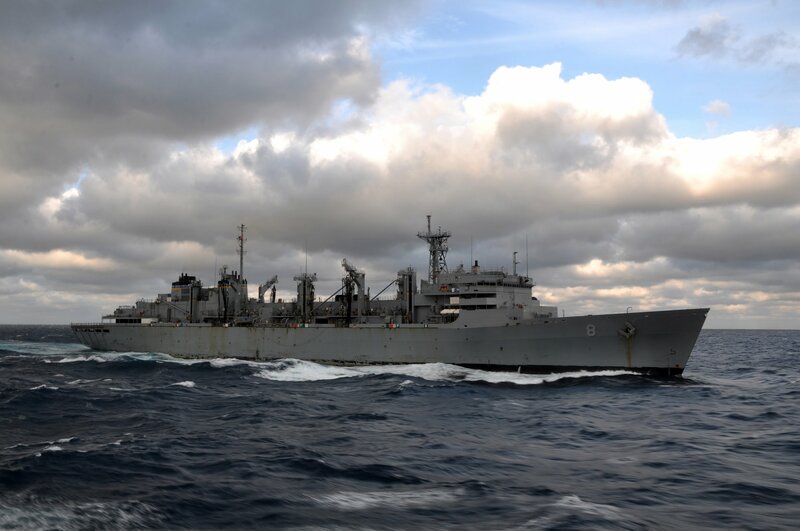 230k USNS Arctic (T-AOE-8) pulls alongside the amphibious dock landing ship USS Fort McHenry (LSD-43) before a replenishment-at-sea as part of the Carrier Strike Group (CSG) 4 composite training unit exercise (COMPTUEX). 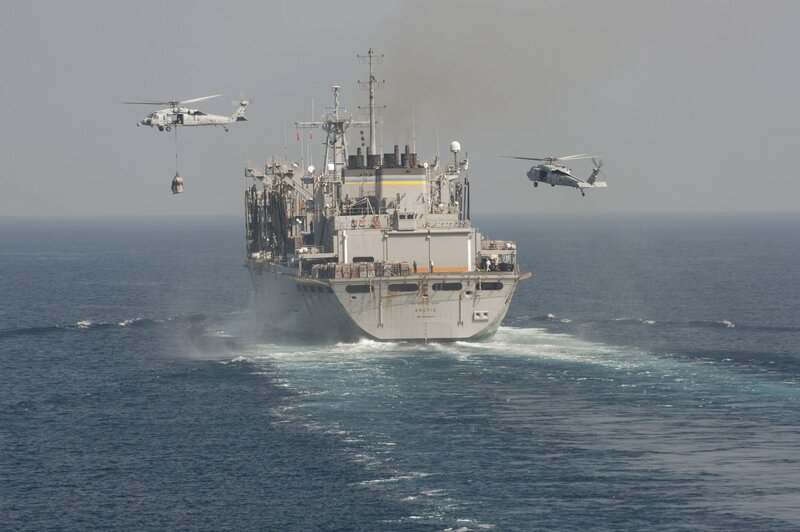 COMPTUEX is the final pre-deployment exercise that certifies the combined Kearsarge Amphibious Ready Group and 22nd Marine Expeditionary Unit's abilities to conduct military operations at sea and project power ashore through joint planning and execution of challenging and realistic training scenarios. CSG-4 mentors, trains and assesses East Coast units preparing for future deployments.